Image caption The number of UK road deaths has fallen to a new low. Newly qualified young drivers should be banned from night-time motoring and carrying passengers of a similar age, Cardiff University researchers say. They said such "graduated driver licensing" for those aged 17-19 could save more than 200 lives and result in 1,700 fewer serious injuries each year. Similar schemes already exist in New Zealand, Australia and parts of the US. But motoring organisations say the limits - which could last up to two years - would be difficult to enforce. Meanwhile, the Tune into Traffic campaign group has highlighted the dangers of listening to music on MP3 players and iPods while driving and walking. Western Australia: Under 19s must have zero blood alcohol level at all times, night-time motoring banned for first six months. New South Wales, Australia: New drivers display 'P' plates for 24 months, observe extra speed limits and zero alcohol. California, US: New drivers face night-time ban and cannot carry passengers aged under 20. New Zealand: Three stages to getting licence, each with fewer restrictions. Drivers under 18 must hold restricted licence for 18 months. Do you deserve a licence to drive? The research will be presented at the World Safety Conference, which will hear from other experts on how road safety could be improved. While road deaths have now fallen to an all-time low, 2,222 people still died on the roads last year. Experts at the London conference will argue this figure can be reduced even lower with more restrictions and greater awareness of risks. The Cardiff University study was compiled after analysing road accident data from 2000 to 2007. Research suggests one in five new drivers crashes within the first six months. The Cardiff team says that by targeting them with graduated driver licensing, many accidents might be avoided. 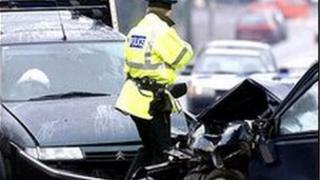 Cutting the UK's accident rate would also save the economy £890m, the team estimates. Dr Sarah Jones, who led the research, said: "Graduated driver licensing works in other countries and there's no good reason why it wouldn't work here." She said restrictions on new drivers could be in force for as long as two years and could also include a total ban on alcohol. She said a debate would have to be had over whether to limit the restrictions just to young drivers or all new drivers. But the head of road safety at the AA, Andrew Howard, suggested while there would be benefits to graduated driver licensing, they could be outweighed by the disadvantages. He said it could penalise those who work at night and need to drive, while police may struggle to crack down on those who flout the rules. "It would give totally the wrong signals to introduce new laws aimed at young people and then not enforce them - many would feel that all motoring laws could be broken," he added. A spokeswoman for the Royal Society for the Prevention of Accidents also cast doubt over whether the scheme could be properly enforced. Terry Jones' daughter, Louise, 16, was killed with three of her teenage friends in Powys in 2006, in a car driven by an 18-year-old man who had just passed his test. "They should abolish the driving test completely. "These children are not being taught how to drive at all, they are being taught how to pass a test. "Instead, there should be a driving log - similar to aircraft - where learners have to log 200 hours with an experienced motorist. "They should drive at night, in the sunshine, in rain, snow, ice, on the motorway - under instruction at all time. "There should also be limitations on the number of passengers. "And parents have got a big part to play... some of these 17-year-olds are driving brand new cars. "Personally I think if these children go out and kill, and parents have bought the car, the parents should be charged with accessory to manslaughter, just the same as the driver." She said she wanted to see more evidence about how it would work in the UK, adding that improving education and awareness with further training for new drivers might be more beneficial. University of London experts will also put the case for more 20mph zones, arguing it could help reduce injuries - particularly in deprived areas. Their research will show that those in deprived areas are twice as likely to be killed or injured than those in affluent areas. The Department for Transport said most new drivers wanted to be responsible, but a small minority put themselves and others at risk. It said a new independent driving element would be added to the current test, allowing candidates to demonstrate their ability to be safe in more realistic situations. A spokesman said: "We are considering what other steps we can take to improve safety for new drivers. "In doing so, we need to ensure we do not unfairly penalise responsible young people who rely on driving to get to work or college." Tune into Traffic will stress the dangers of listening to music while driving and walking. Tune into Traffic's Manpreet Darroch, who has helped produce an advert warning about the risks of being distracted by music, said: "This is of particular importance as the usage of iPods and MP3 players has significantly increased and young people's lives are being destroyed unnecessarily." BBC News website readers have been emailing their reaction to this story. Join the debate: Do you deserve a licence to drive?